(Newser) – Many staffers with the Jeb Bush campaign are already starting the job hunt ahead of Saturday's South Carolina primary, apparently pessimistic about Bush's ability to stay in the race, Politico reports. According to the Washington Post, Bush's final campaign event in South Carolina "felt bittersweet." "Staffers and volunteers hugged warmly, realizing that they had just one more day to convince Republicans to pick their guy," the paper states. People within the campaign are denying anyone is looking for a new gig just yet. But that isn't the story coming from political consultants in Florida, who say they've received several resumes already. 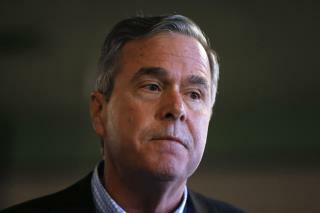 “I can unequivocally tell you that people are looking for work," one Bush donor tells Politico. Nothing sarcastic, but just an impression I got when first becoming familiar with Jeb: GAWD! I remember his brother telling the press years ago that Jeb would never make it as President because he wasn’t a lawyer. What he was saying was that Jeb was a dummy and just a nice neighborhood kid who smiled broad-mouthed with cocked eyebrows for lawn-and-garden jobs from folk smiling compassionately who lived nearby. I bet they leave Bush staff member off their Resumes.